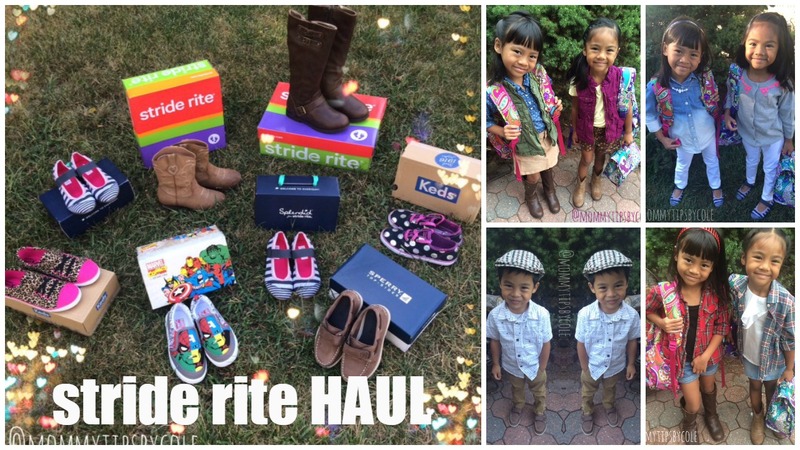 Time for a Fall haul…a shoe haul for the kids from Stride Rite and it’s a GIVEAWAY TOO! I have had these shoes since the beginning of the school year but wanted the kids to use them for a month to give my full honest reveiw of each shoe. I also share some outfit ideas I did for the kids as well. Hope you find this review helpful! You can find all of the shoes here. 38 Responses to "STRIDE RITE Haul, Review & GIVEAWAY! – 8 Fall Shoes for kids"
Love love these shoes! Can’t wait to see who wins a pair! I love those boots. Lydia would look so cute in a pair. Love Stride Rite. My girls are really into boots right now. Super cute. Hey mama! Thanks for the Giveaway! Strideride is an awesome brand & I. Hope I win a pair of the chestnut brown boots that Emelyn has, for my daughter! Love stride rite. The sperrys are too cute! I would choose the marvel spider man spider reflex shoes for my son! Great shoes awesome haul I love stide rite! I’d like the Kid’s Merrell Jungle Moc for my son. Your family reminds me so much if mine. I have 2 girls and my youngest is a boy. …and I’m Filipino. My husband is Laos but he jas the same style as yours. All the shoes are cute but my oldest has been begging me for “cowgirl” boots for so long! I think my daughter would like the Kid’s Stride Rite Disney Wish Lights Belle sneakers. I like the Merrell All Out Mary Jane shoes. I want some keds for the kids! I might choose the Stride Rite SRT Preschool Declan for my grandson if I win! Oh I really love the Kid’s Stride Rite Racer Lights™ Velocity! Carter would love those. I love Stride Rite Rhetta boots. Very cute. I would choose the Preschooler’s Merrell Chameleon Mid Lace Waterproof shoes. Thank you for the wonderful giveaway. Baby’s Stride Rite SRT Soft Motion Hammett would be cute on my son. I like the Stride Rite Medallion Collection Dane. My son would love them. The tall chestnut colored boots or the lepord print shoes! Deff would get some sperrys for Ryan!!!! Great taste! I just love the thalia brown boot for girls! I would love to win any of the shoes! My daughters both need boots, so I think I’d pick the brown leather boots. I like the Stride Rite Medallion Boots for my son. They look great and I’ll love to see how comfortable they are. The site has so many options that it’s hard to choose. I would probably pick Stride Rite Medallion Collection Bilson in size 4.5. The marvel sneakers are adorable!